I’ve been making this Homemade Caramel Corn for years. I think the first time we made it was back in 1999 when Dan wanted me to make something fun! I like this recipe for caramel corn because the caramel isn’t too heavy. 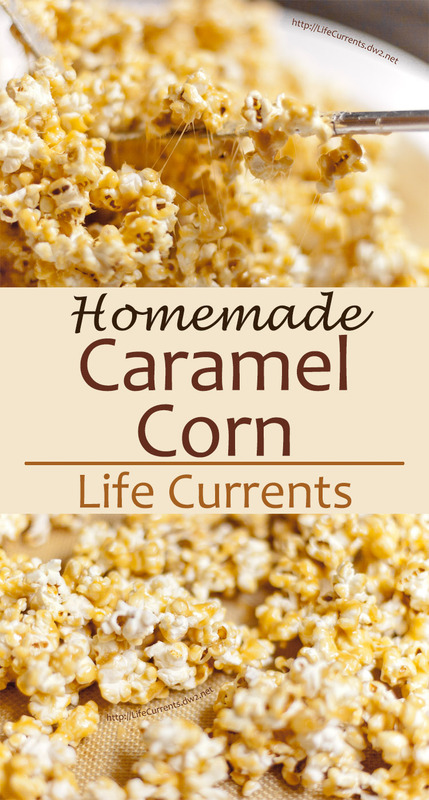 This makes a nice light Caramel Corn with a lovely crunchy coating. It’s also really inexpensive to make, but everyone I’ve ever served it to has been super impressed by it! We usually make only ½ a recipe as there’s just the 2 of us in the house, and this makes a lot of Caramel Corn! It would make an awesome homemade gift for someone you love as well. Think Christmas or a lovely hostess gift. I mean, who wouldn’t love some homemade Caramel Corn! To pop the popcorn, I prefer an air popper for this recipe. It makes nice light unseasoned popcorn. But, if you don’t have an air popper, feel free to make your popcorn the old-fashioned way on the stove top. Just don’t use microwave popcorn for this, as it has salt and fats already added, and you want the popcorn to be as plain as possible. Preheat oven to 200 F degrees. Divide the popped popcorn between 2 large bowls. Oil 2 rimmed baking sheets very well, and set aside. In a large deep saucepan, combine the brown sugar, corn syrup, butter, salt, and cream of tartar. Inset a candy thermometer. Bring to a boil, and cook the mixture over medium heat for about 5 minutes, stirring occasionally, until the thermometer registers 260 degrees F. (hard ball stage). Remove from heat, and quickly stir in the baking soda. The mixture will foam up quite a bit. Pour the syrup mixture over the popcorn, half into each bowl. Work quickly to coat all the popcorn with the caramel. Spread popcorn evenly on the baking sheets, and bake for 1 hour, stirring and rotating the trays 3 times. Remove from the oven and spread popcorn on wax paper to cool, breaking up the larger pieces if necessary. Store in airtight containers. ahhh the gooey caramel corn goodness!